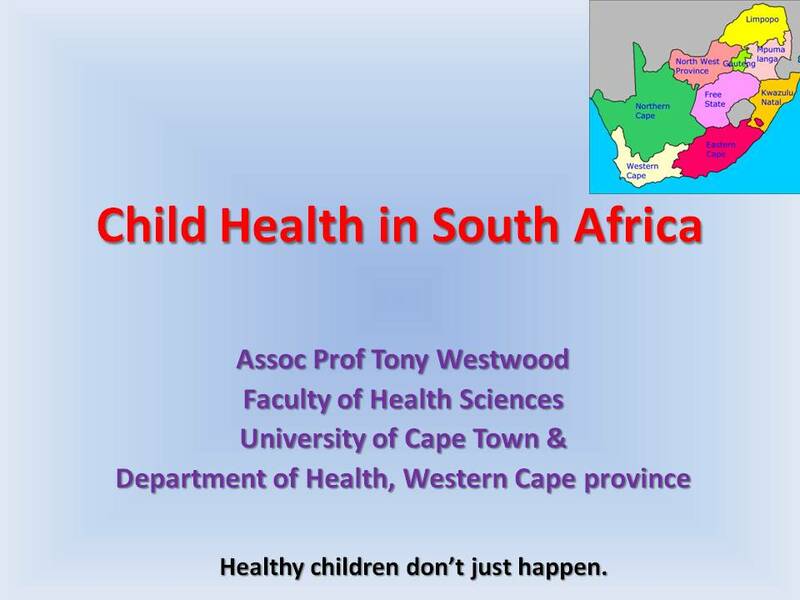 Lesley has written an excellent article setting out what the current situation is in South African maternal, newborn and child health. I strongly recommend it to anyone wanting to get a grasp of the issues. This post contains the rest of the Liturgy set to music. The initial sections are found here. Any feedback on this music can be sent to me at westwoodsmusic@gmail.com . The 1989 Anglican Prayer Book contains the Communion Service. Andre Frieslaar and I are members of Christ Church Kenilworth in Cape Town. Stimulated by a series of evenings for composers and lyricists, we put together arrangements of some of the prayers in that liturgy. Upbeat ones are in E major; quieter ones and some responses are in C major. There are thematic links between some of the items to make it easier for the congregation to learn the setting. If you use any of this, you might consider making a contribution to The Warehouse. This arrangement by Andre uses the first two lines of the Gloria as a refrain. The Kyrie: Lord have mercy. 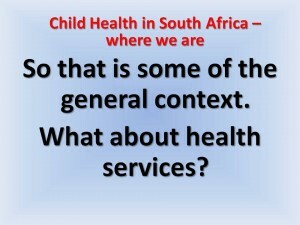 Part 3 covers what might be done and is being done to improve child health outcomes in South Africa. So now, where would we like to go? Well, if I’ve done my job correctly, you should be able to tell me this. 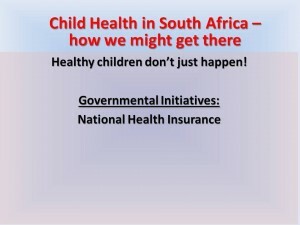 You should be driving us there, itching to move the country on to better outcomes for children. The vision is big. Turn things on their head; don’t talk of sickness, talk of health. Build, build, promote, promote, prevent, prevent. We have to make children strong; when they are sick, we must get in there early and turn things around. 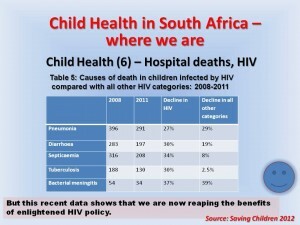 No more HIV; every baby on the breast for at least six months. Join up a primary health care services, clinic with community health centre, community health centre in clinic with district hospital – to provide a more comprehensive service to children, whether parents are cared for. Silos are silly. It just moved to a place where silo-thinking is the subject of ridicule and mirth. 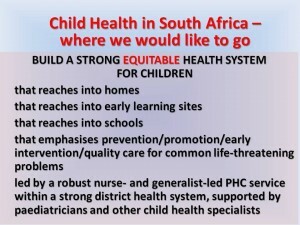 The second thing we want to build a strong in equitable child health system. The blueprint is on the slide. 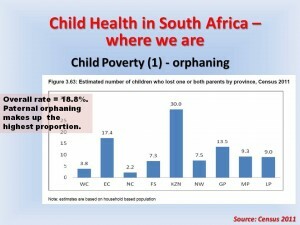 What the data I have shared with you show is that, if we want healthier children who can look forward to a healthy long life, we must take health services to them – this is true for children to a greater extent than it is for adults in our needy communities because their access to all the aspects of health care is utterly dependent on others. 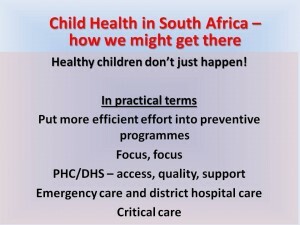 We need to improve the way in which primary health care services in districts are supported by people with more specialised child health knowledge and skills. Note that I do not say paediatricians. The paediatrician is just one of the cadres who need to do this job, or be allowed to do this job. 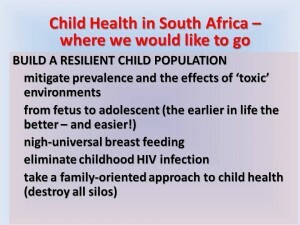 So we can move on to how we get to this wonderful situation of resilient children using resilient health services. 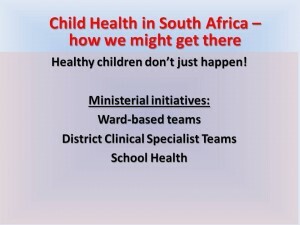 I will inform you of a few initiatives that you hope you will support while doing your bit to build resilient children in the health services where you work – in your office and beyond its walls. 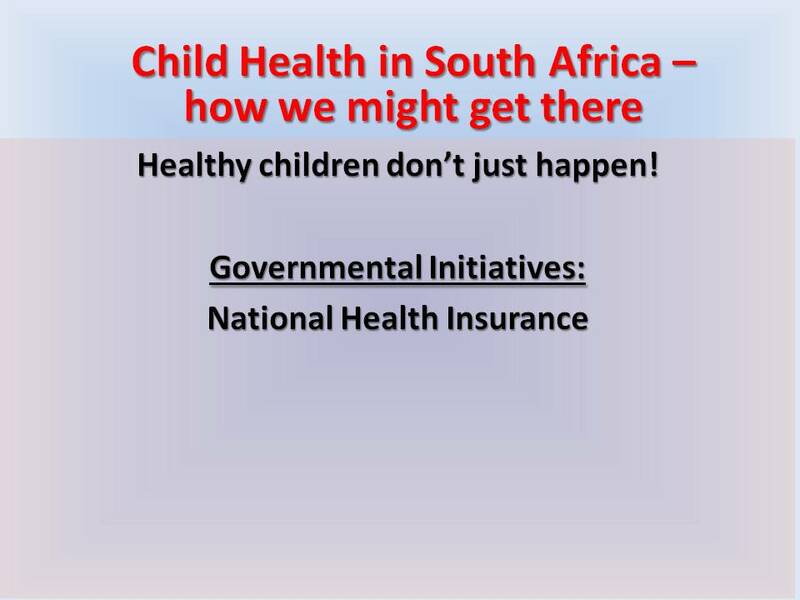 National Health Insurance (NHI) is fundamentally about increasing equity and the country’s children more than anyone require greater equity. 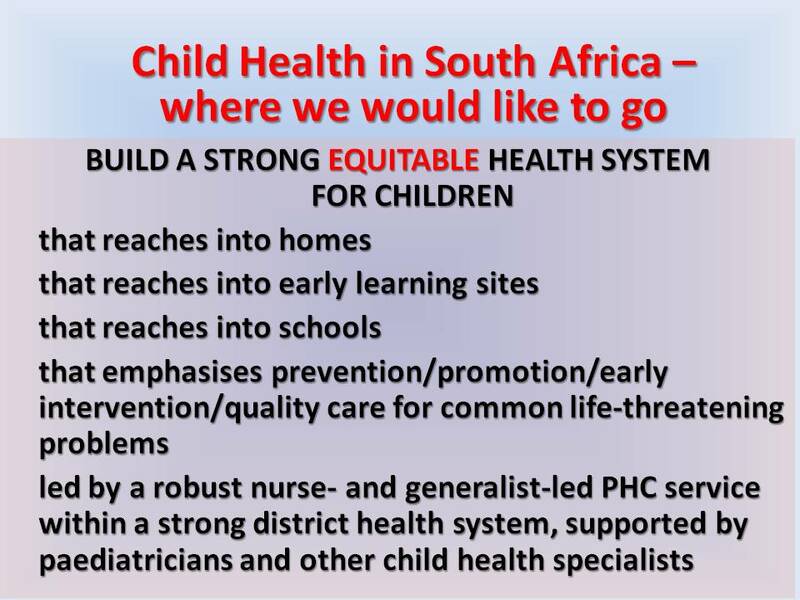 How we do this cost-wise through NHI I’m not qualified to say, but we must try and all work to make something better happen, I have no doubt in NHI is the chosen vehicle. 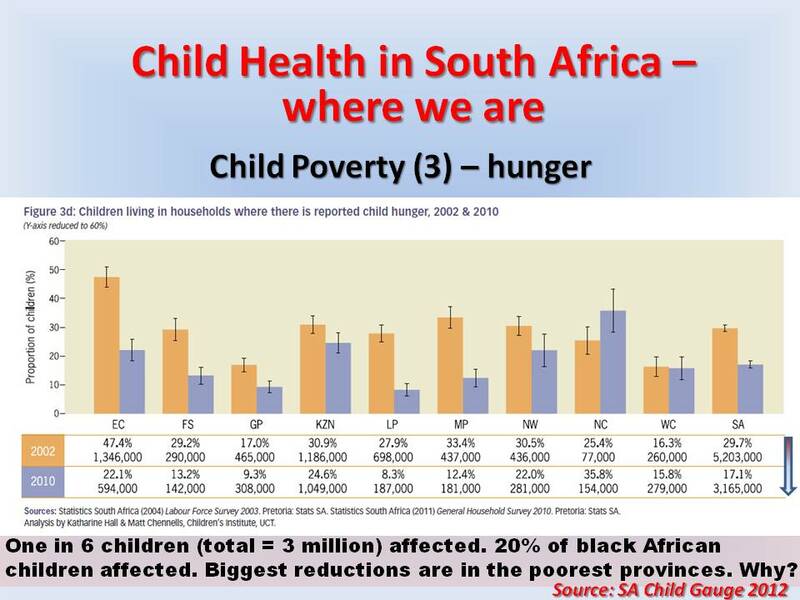 Access to a qualified medical opinion in primary health care is woefully inadequate for children in South Africa, let alone a specialised opinion. 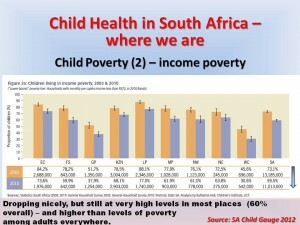 We must increase access: NHI promises this. They just get on board and moulded for the children. Primary health care re-engineering. 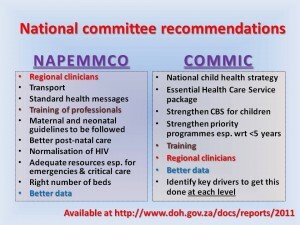 These are ministerial initiatives to improve outcomes for pregnant women, newborns and children. While not comprehensive, they do take up some of the themes I have been rehearsing: taking services to children – that’s the Ward-based teams of community workers led by nurses; district clinical specialist teams – a small group of specialised doctors and nurses working in support of the district health system by district or in the catchment area regional hospitals to improve pregnancy care and its associated surgery, to improve neonatal and child outcomes; enhanced school health services aiming to bring services to a captive audience of children and adolescents. 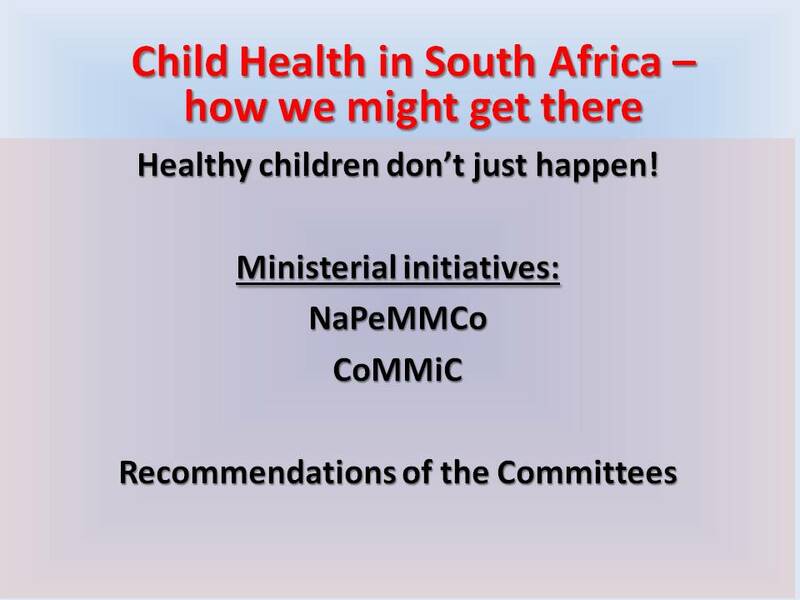 Number three is two sets of recommendations made to the Minister and thus the health systems by two ministerial committee set up to advise on how the country can save children’s lives and improve their health. Here are those reommendations, made independently but with common elements as highlighted. 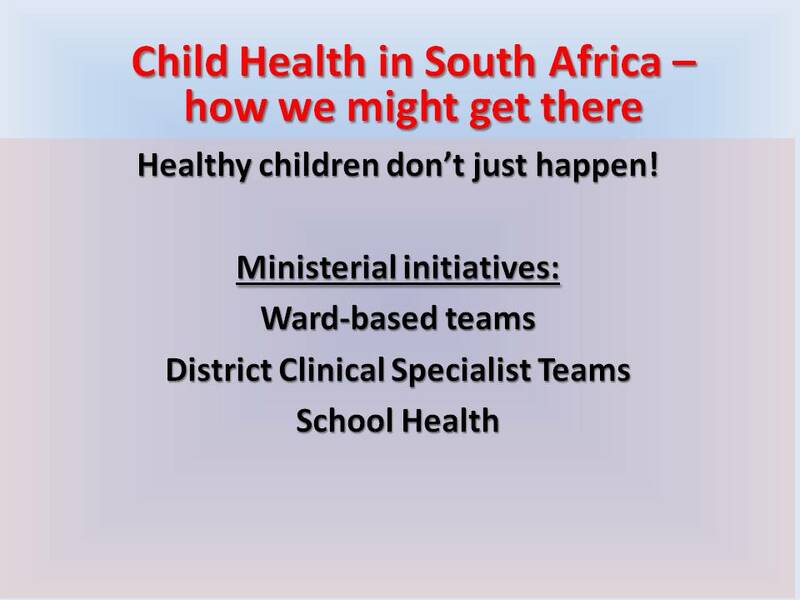 ‘Regional clinicians’ in this slide links conceptually to the district clinical specialist teams. 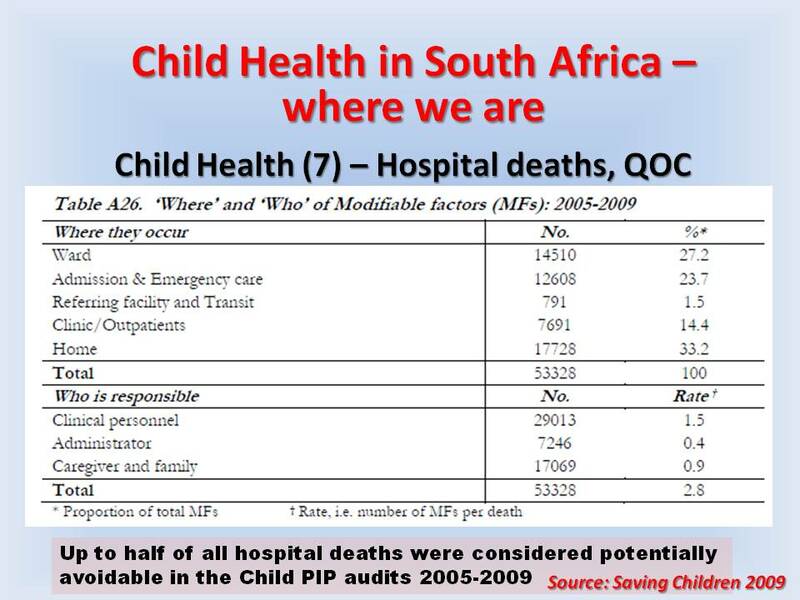 Note the emphasis on training professionals – that’s a result of the audits that tell us how much morbidity and mortality occurs AFTER professionals have become involved in pregnancy, neonatal and paediatric care. 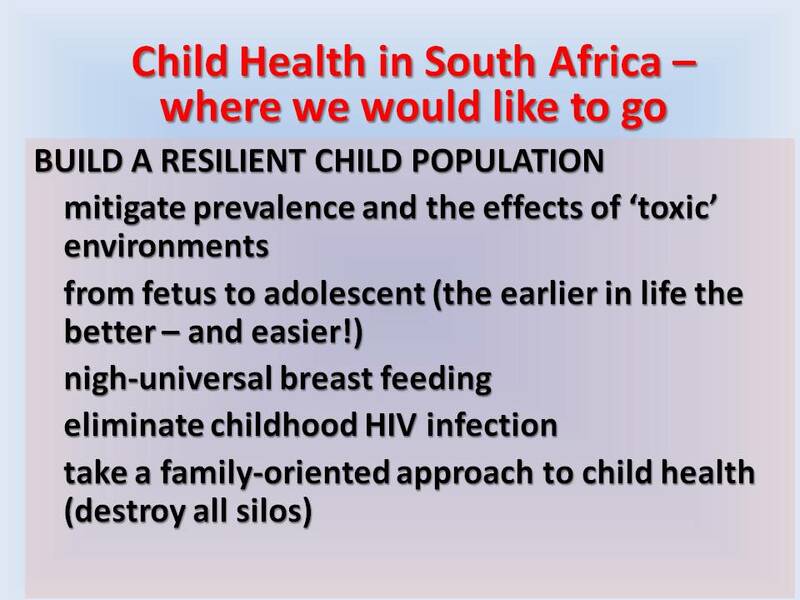 The proposal includes undergraduate and basic nurse training as well as formalising what we teach in terms another young professionals about the care of children. Please read more at the link given here. This slide precises these approaches in a few words. Focus on the basics. Focus on the potentially severe and damaging conditions. Emergency care and critical care. 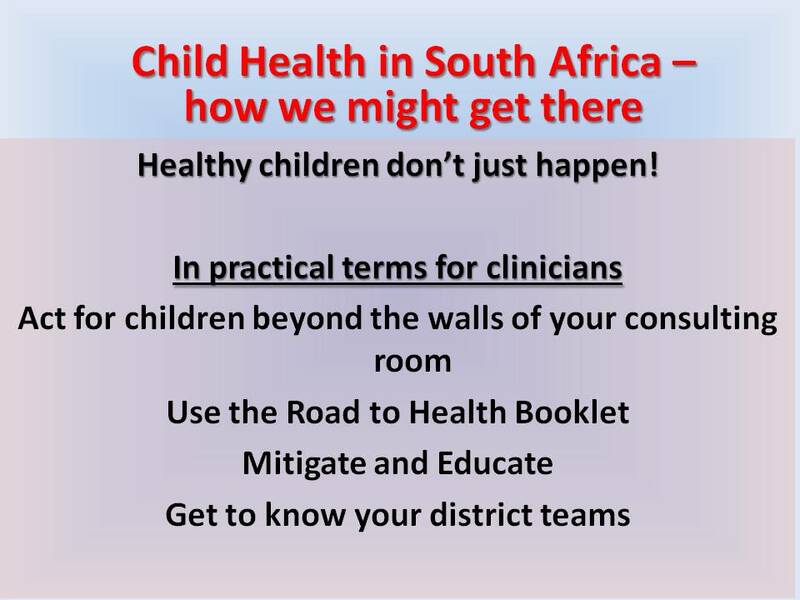 This slide can guide individual clinicians on what they can do in everyday practice to protect children and promote their health. The Road to Health Booklet is a marvellous vehicle by which clinicians can travel with their patient through their words written about what they have done and what they have explained to the caregivers or family. looking at health services as such as I am hoping that when we get there, we can look at them from the point of view of there being a solution rather than a problem. 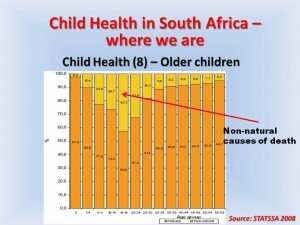 So let’s look at some indicators of child health in South Africa. 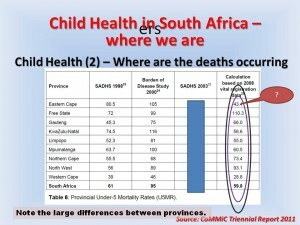 Here’s the first indicator which is in fact not an indicator of child health at all: infant mortality rate or IMR is well established as a measure of a community development, and not directly of health – the poor little canaries (otherwise known as infants) being those who tell us by dying whether we live in a dangerous, poor human environment for not so dangerous human environment. 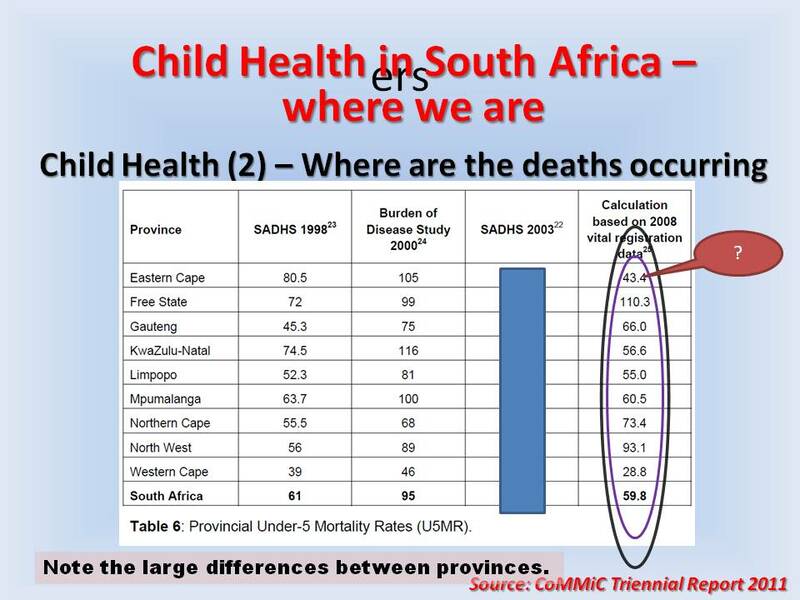 The arrow on this table which comes from the MRC Rapid Mortality Survey published in 2012 shows that South Africa’s infant mortality rate is dropping and has done so rapidly in the last few years. 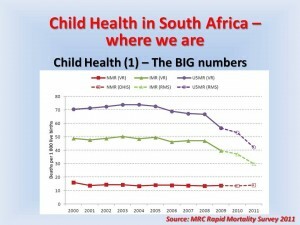 The same is true of the under five mortality rate. This is shown more starkly on the next slide. 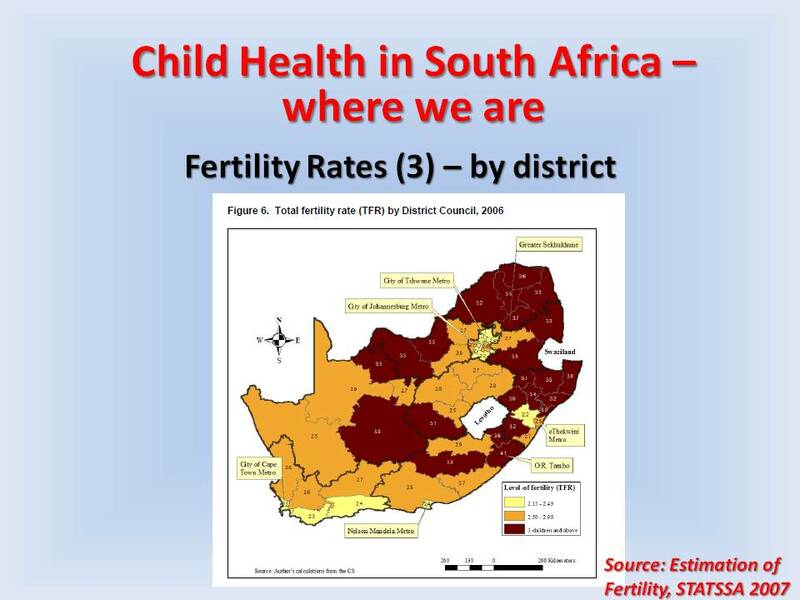 This slide shows in the circled area, things things vary considerably by province [the big ? here is the Eastern Cape whose figures based on vital registration seemed to be way out of kilter – led by the former Transkei area – the OR Tambo district – which we saw is one of the areas with high levels of deprivation.] What is more, things vary considerably within provinces. 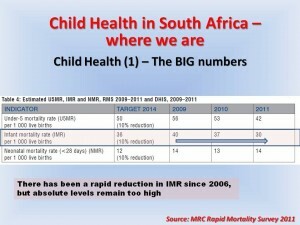 Even in that Nirvana known as the Western Cape province, you will find areas the child mortality levels similar to areas such as Limpopo, and well above the national average. So there is a journey required of us all. So what are the children dying of? 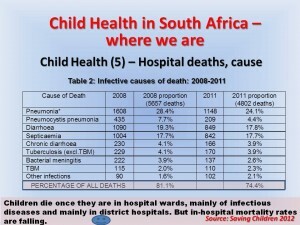 The top of the list is diarrhoea: one in five deaths under 14 years of age in this country is due to diarrhoea. Perhaps I should say that again. Amongst the youngest children the proportion is even higher. Next on the list are causes of death within the first month of life and the majority of these are within the first week of life and relate to 2 big causes: prematurity with associated complications and, rather sadly, birth asphyxia (euphemistically called “perinatal problems” on this slide). 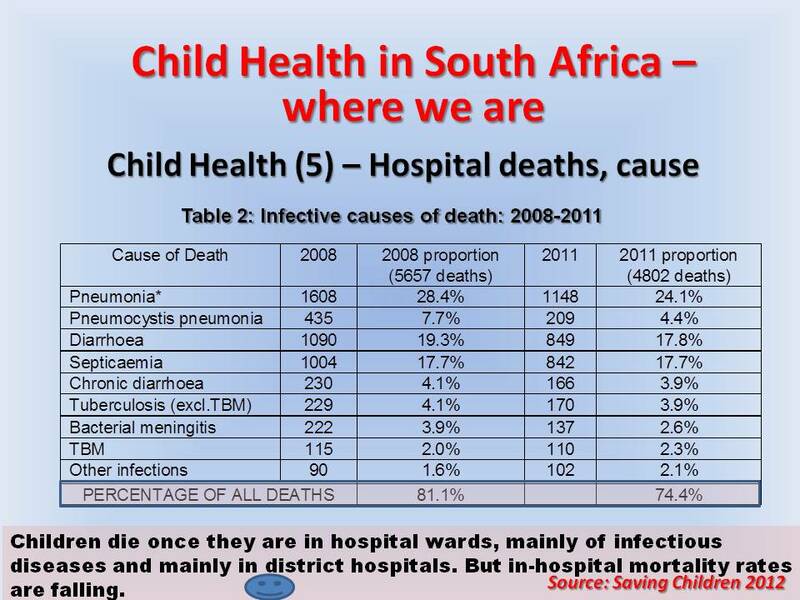 Pneumonia and respiratory infections get in at number three in South Africa. 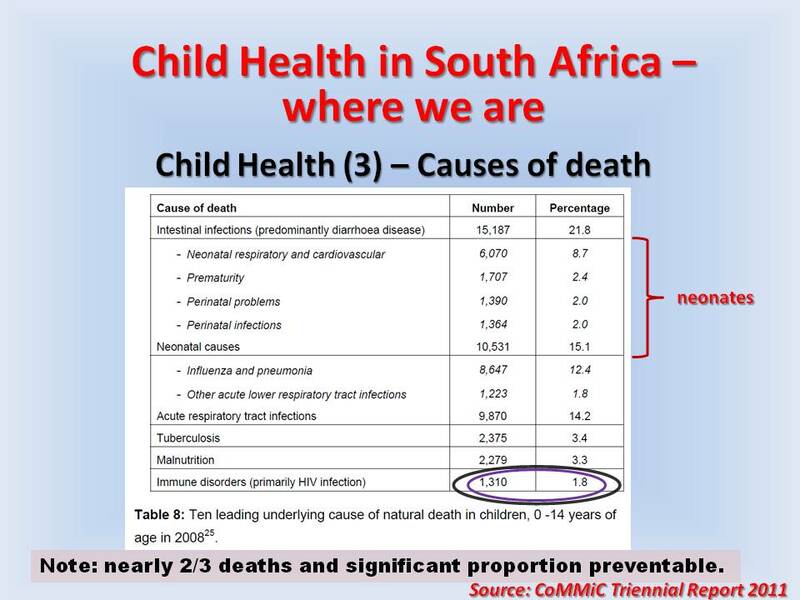 Note that these figures refer to the period before the introduction of rotavirus and pneumococcal vaccines. 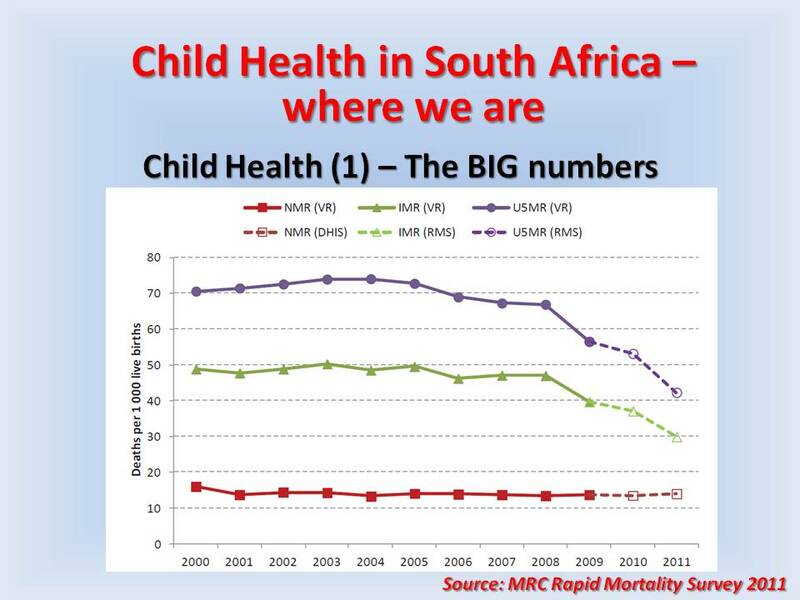 Evidence from 2009 is diarrhoea and pneumonia deaths are dropping, but neonatal deaths as a whole have not risen to the top of the pile yet. 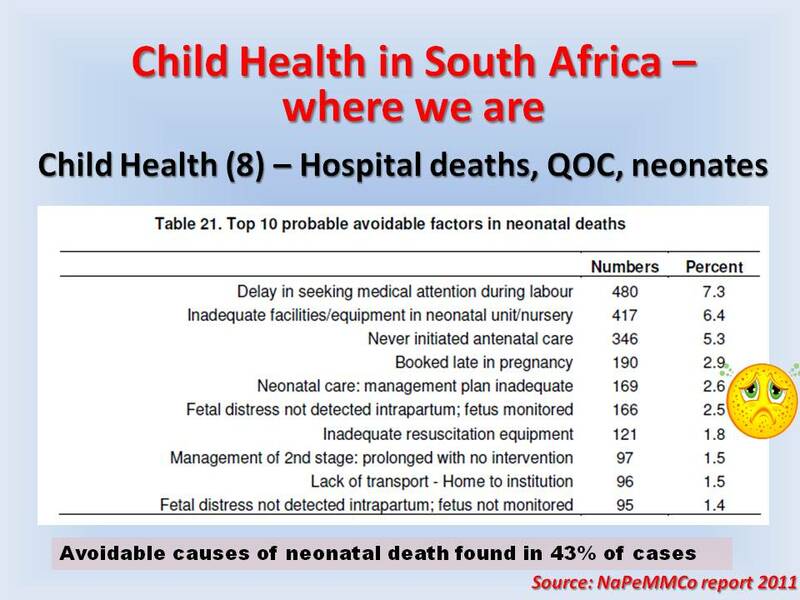 But neonatal deaths are stubbornly sticking at the same level, presenting a challenge to us all. Had a high status of TB is not only an adult phenomenon. Where did children get there TB bugs from? Why can’t we stop it when we know that their immune systems cannot contain the infection once they have inhaled it? Why do we allow contact tracing to miss children? I have circled ”immune disorders” because, although there last on the list, this is largely AIDS. 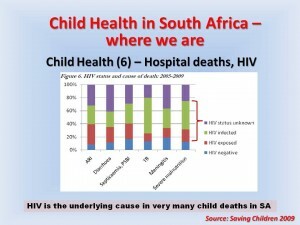 But AIDS is a big contributor to all the other causes because, as with adults, HIV is not usually put on the death notification form, or its presence has not been ascertained). Or it is not given as a direct cause of death, but of course it isn’t. So these 10 causes constitute two out of three deaths. I think you will agree with me that pretty much all of them are preventable to a large degree. Keep this in mind when we come to everyone to go and how to get there. Very obvious where to; but how to get there? 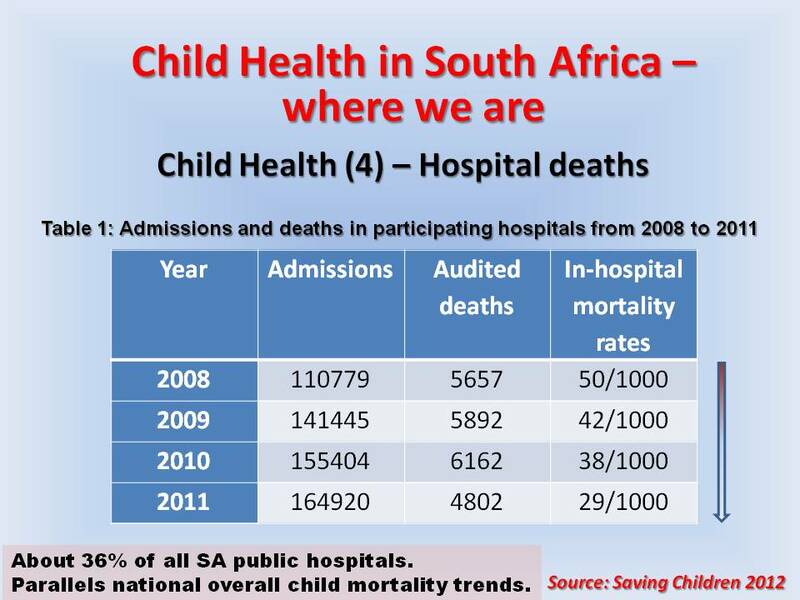 Now looking at hospitals where, beyond neonatal units and wards, just under half of young child deaths happen. 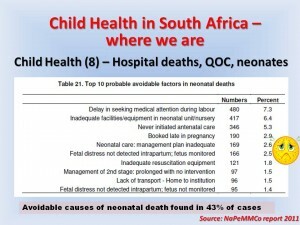 (Note that most neonatal deaths occur within the health system, largely in nurseries, in all provinces. We will come back to them soon.) Doctors do most of the therapeutic decision-making in hospitals, so concentrate please. It may explain why children get so sick. Malnutrition is a significant co-factor in hospital deaths – look at the purple and green segment; in many of these the management of malnutrition was sub-optimal, especially if it was severe. Food for thought, if you will pardon the pun. 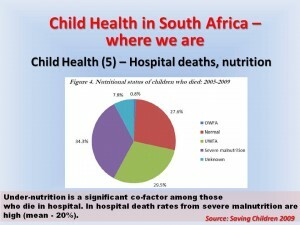 Nearly one in five, folks, for severe acute malnutrition. 20% overall mortality. 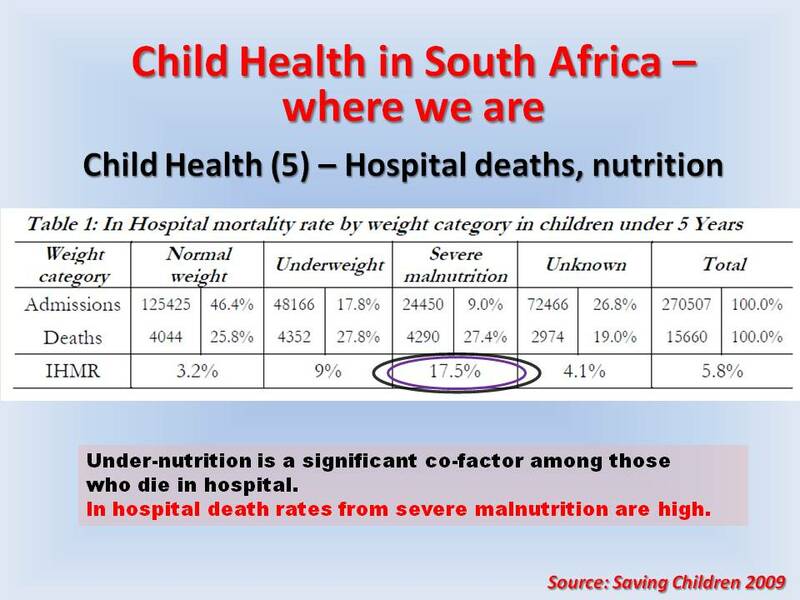 True, sometimes it is the underlying disease that contributes malnutrition, that calls for early identification of illness, and earlier intervention to prevent and treat concomitant nutritional diseases. 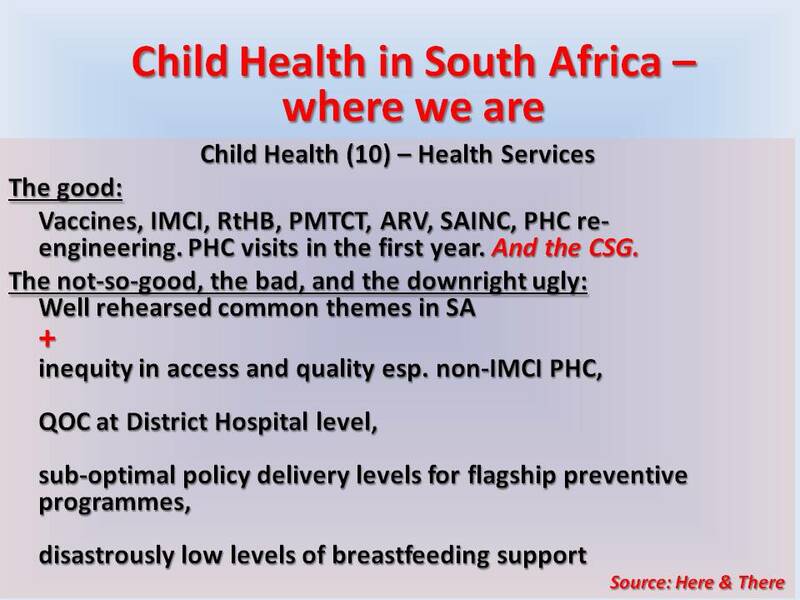 Anyone not want to promote breastfeeding after seeing this slide? But we need to be sober. 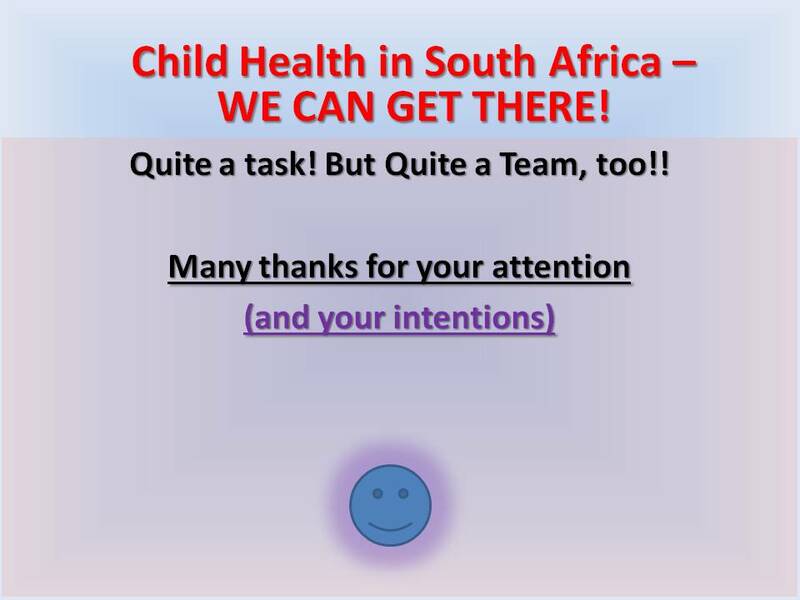 When our intrepid auditors reviewed their own practice and that of the primary health care system that referred sick children, they found that much more could have been done a lot better. 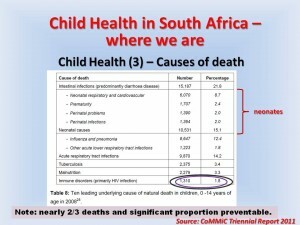 Nearly half the deaths might have been avoided if things had been handled better – please remember that we are talking about things like diarrhoea and pneumonia here. The top of this table indicates the sites where things might have been done better. 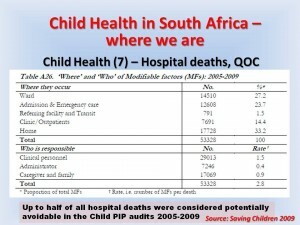 Hospitals and homes of the main places where care must be improved if fewer South African children are not to die. Delaying getting to care is the main problem in homes raising questions both the recognition of danger signs but also ease of access to primary and urgent health care for our communities. In the lower half of the table, note that every death between one and two modifiable factors were ascribed to clinical personnel who should have done things better. For diarrhoea, this mainly relates to recognition of shock and dehydration and use of fluids – fundamental skills, surely!? 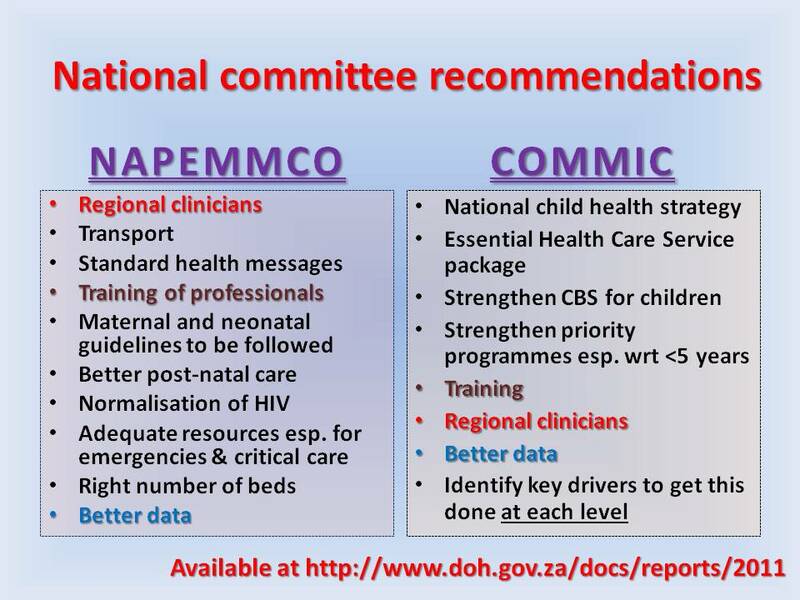 And for neonates there is a lot that could have been done better too as this slide shows. Why are women presenting late in labour? Why are many pregnancies and booked? Why don’t we know how to look after sick newborns in our nurseries but we don’t equipment properly? Most of the deaths I have covered so far are in children under the age of five years. What about the older children? This graph shows that as you get older, your chances of dying of a non-natural cause rise to nearly half of all causes in the ages 15 to 19. Other main causes include AIDS and cerebral palsy. 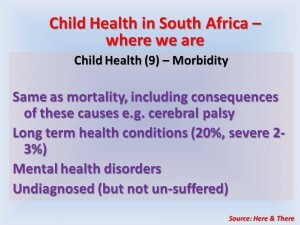 Remember that much cerebral palsy in this country is due to secondary causes such as birth asphyxia and meningitis, so deaths in older children must be considered potentially preventable in this day and age. Taming gangs, alcohol and fast cars is a bigger challenge. … We’re talking about the same things that matter less severe scale. 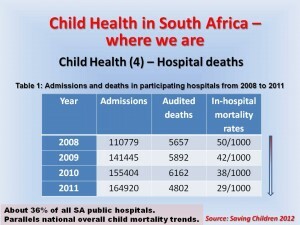 So what keeps the primary health care system in hospitals busy the same things that cause children to die. The same things that need to a lot of child disability. It is important to recognise that children have long-term problems in significant numbers. Herein are the children with neuromuscular diseases and disabilities, congenital conditions such as cardiac disease and haematological disorders, acquired diseases such as type I diabetes, rheumatic disorders and the large number of learning disabled and attention deficit hyperactivity disorder children and young people. I have separated out mental health disorders because these go a long way beyond the severe things like autism to include a huge level of (often undiagnosed) problems of anxiety/depression and substance abuse. There is a lot here that represents the antecedents of adult somatiform disorders that keep the health system very busy. Almost untouched in this country. 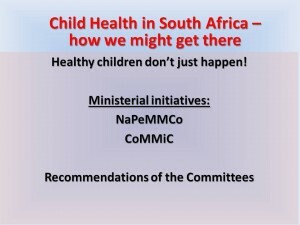 One major concern is that the success of programmatic IMCI-based case management in providing primary health care to children, to the lack of access to more sophisticated care within the primary health care system. My corralling children into narrow IMCI-trained nurse-led to services, we have lost decade of clinical nurse practitioner who was able to recognise and treat a lot of common childhood disorders and make a much better referral to a doctor. 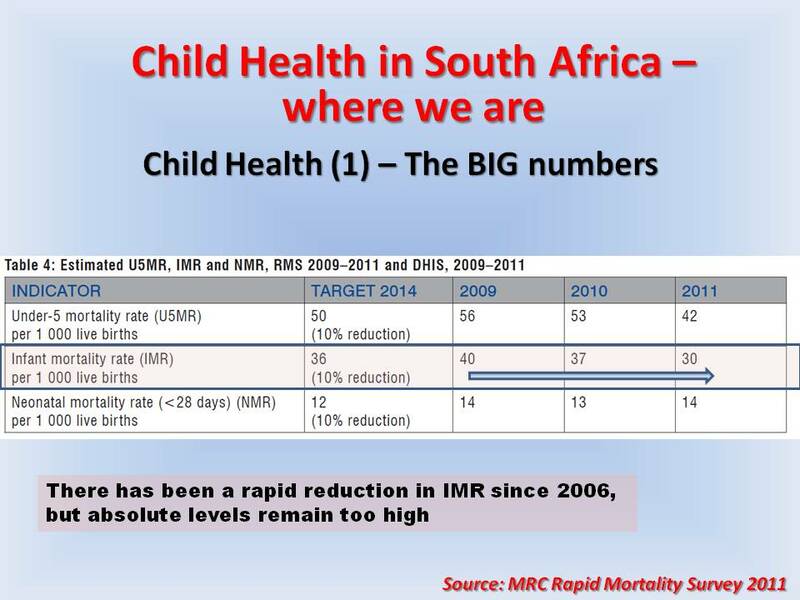 In improving access to and quality of care for a narrow spectrum disorders, we have inadvertently reduced access to care for children with other disorders and children in the age of five years. I will talk to how this might be remedied later. The good first: mostly programmatic and acronymic as shown in the slide. The learning purposes it is worth looking up in the acronyms you do not recognise. When it comes to the not so good, there is much that we know about that affects children as well as adults – in equitable distribution of services and resources, poor service management, staff attitudes, too few staff, waste. The big concern is how some flagship policies such as IMCI, EPI-SA, and PMTCT are inadequately implemented. But on a positive note, much is now being done to remedy this, such as a focused drive to improve efficacy of a complex sequence of activities known as PMTCT with the aim of eliminating new vertical infections by 2015. I have to mention breastfeeding. Do in the health services really believe and its benefits, you wouldn’t think so from the way we don’t provide spaces and energy for it, even some of our maternity services. 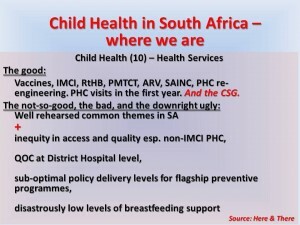 And have you recognise that with a RVs, breastfeeding is the safer, even life-saving option of HIV-exposed babies in that very large deprived community I spoke earlier? With your support, it can be done with massive benefits for the country and the children. It is certainly our intention in the Western Cape – and not only because we looked like a breast with lacteals converging on Cape Town! 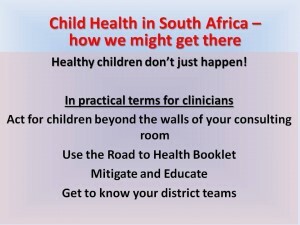 Here is the first part of a slide presentation given recently at a conference of family physicians and primary health doctors. 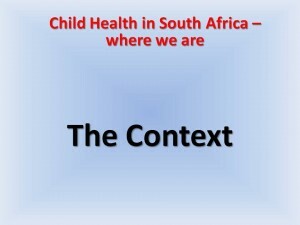 It describes the some of the health-impacting context in which many children are growing up in the country. You will find more detail in the reports given on each slide. 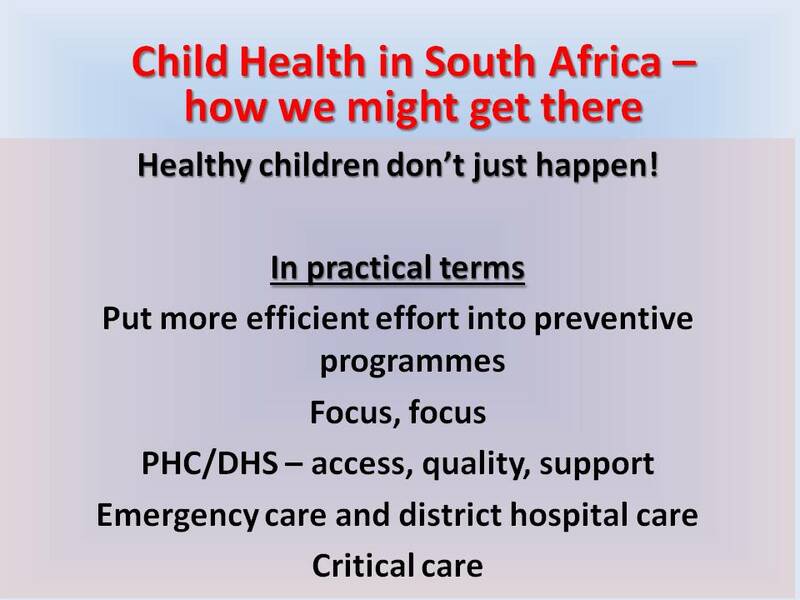 Parts 2 sets out indicators of child health and Part 3 describes some ways of improving things, with a few things that individual clinicians can do right now. 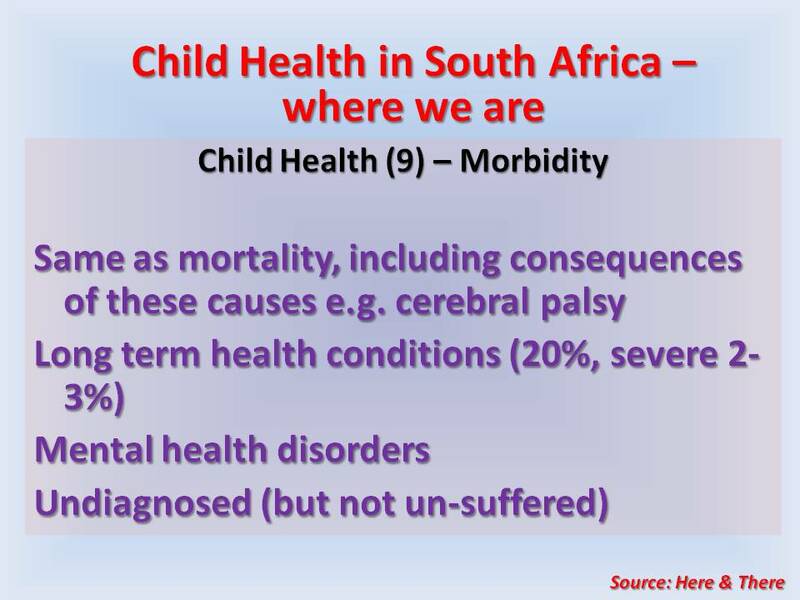 Healthy children don’t just happen, and sick children are largely made sick. If we don’t work at it (and we now know a great deal about what work to do), sick children happen, and even those with unavoidable disabilities or long-term problems gets sicker than they needed to have been. 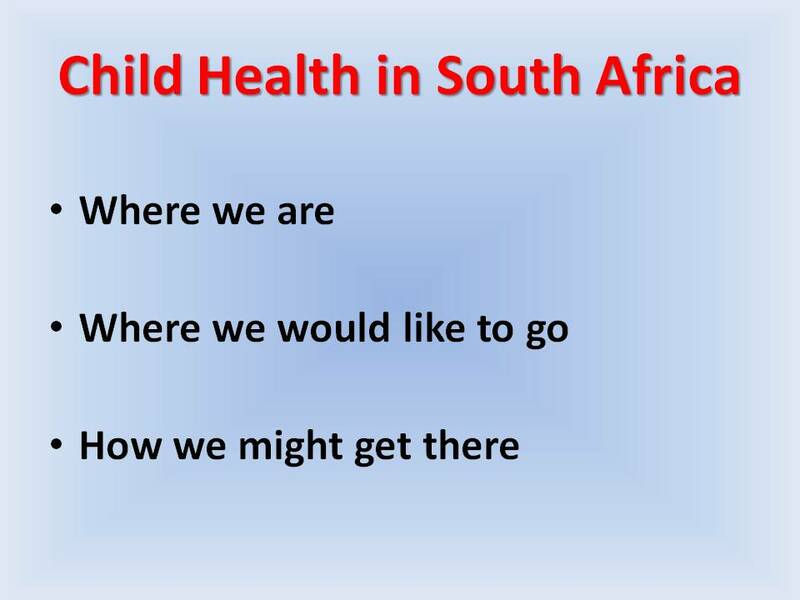 1 In this lecture I intend to paint you a picture of the state of play in child health in South Africa – that is, where we are; the picture of a rosy future – a better road – that is “where we want to be”; and then a description of the vehicle or vehicles we might use to get there. 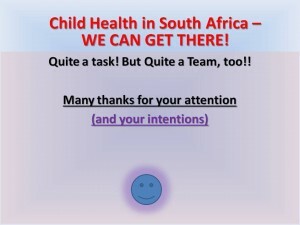 And please pay attention because, if you are a primary health care Doctor or nurse or a child health worker, you are going to be on that journey, and not simply as a passenger, I hope and trust, because without primary health care clinicians on board the whole child health enterprise is sunk! vulnerable to or they are protected by the context in which they live and grow up from before they are born. 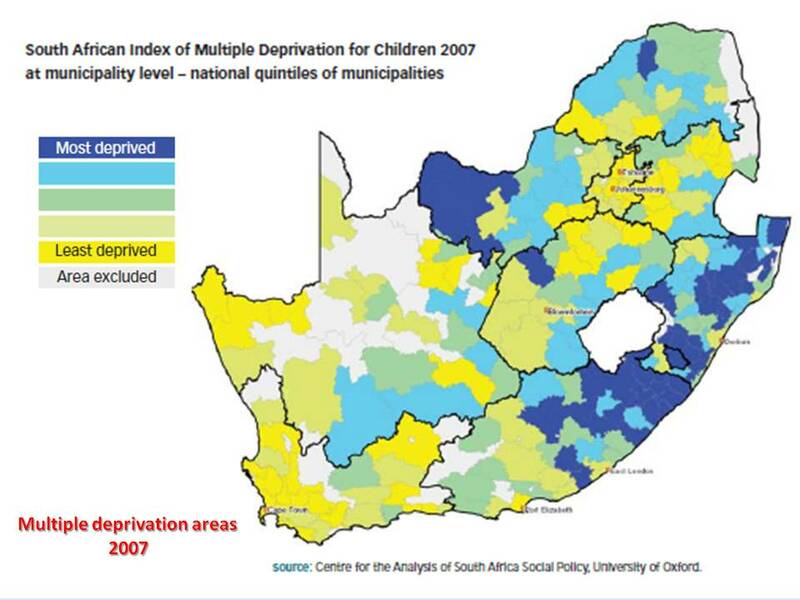 So here are some aspects of the South African context in which children are growing up. 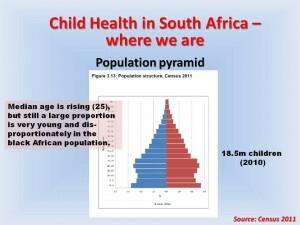 This pagoda-like picture is the South African population by age group with youngest at the bottom and oldest at the top from the 2011 census. As a population, we are gradually ageing with a median age that has risen from 22 to 25 over the last six years, but we are still very young. 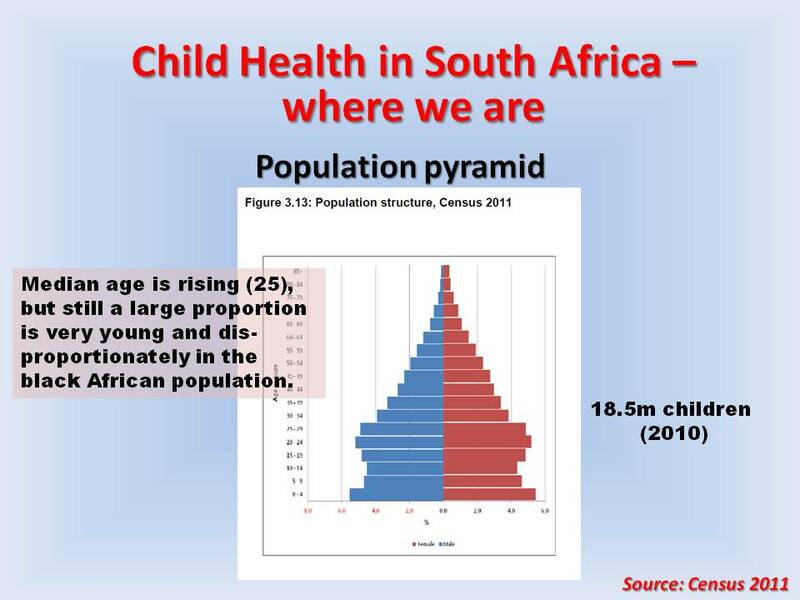 Of our 50 million or so members, more than 18½ million are children under 18, and as you can see from the pyramid, many of them are very, very young. 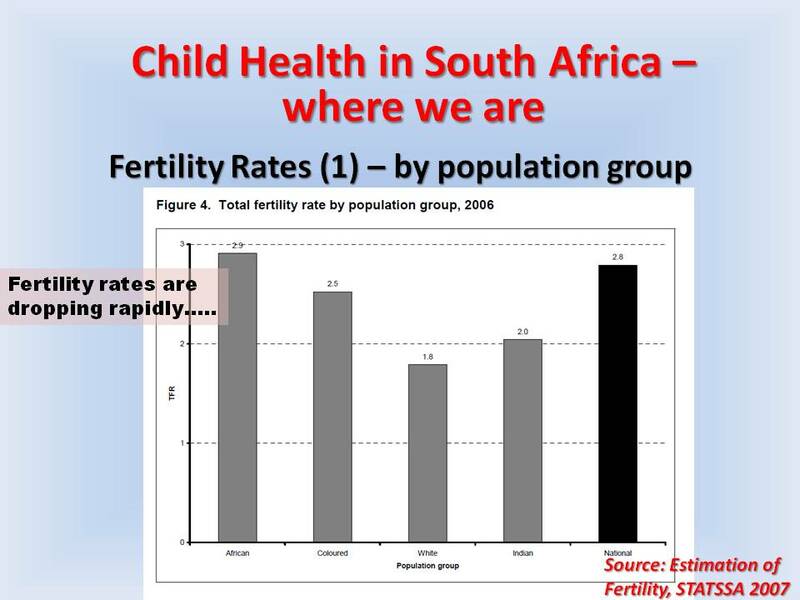 A disproportionate number of young children is in the black African population. You will see why this is important for us to note as we go on. 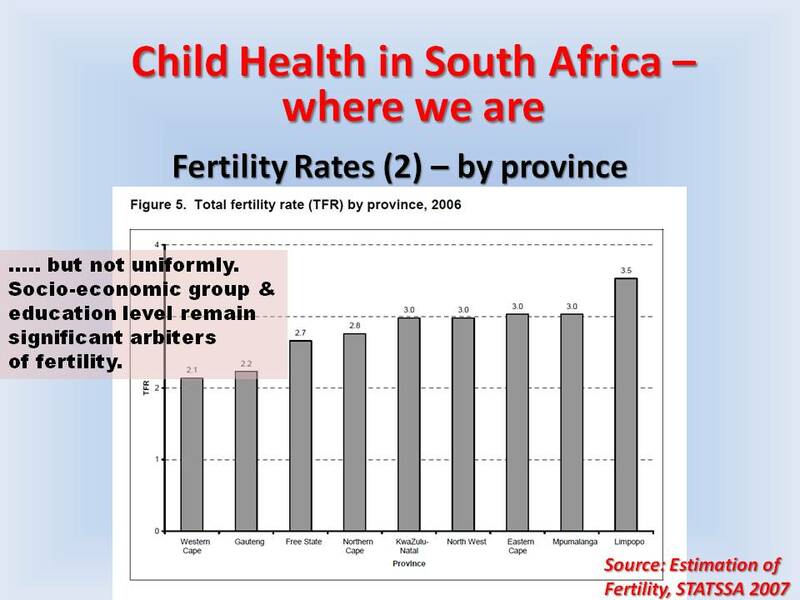 …how living in a largely urban province produces low fertility rates. 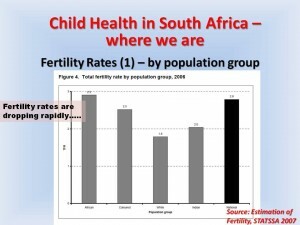 To a large extent, a woman has fewer reproductive choices in these high fertility areas. This increases pregnancy risk and therefore affects fetal, neonatal and child outcomes, as we know. When we look at the children themselves, we find that many are not living with their parents, and, in many cases, this is because their parents or one parent is not alive. We know that the situation significantly increase the risk of poor health for children. It also reminds us in the clinical setting that the woman who comes with a child is in many cases not the child’s mother. It’s a good idea to ask. 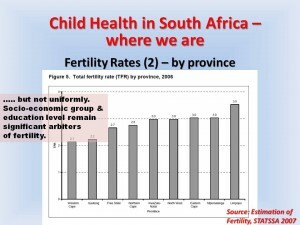 It comes as something of a shock that nearly one in three children in KwaZulu Natal has lost one or both parents. 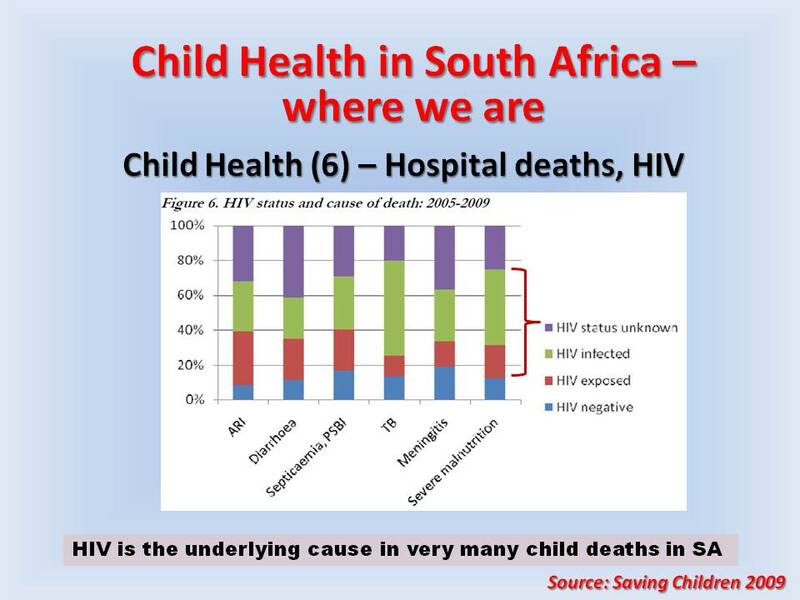 These graphs which come from Children Count project of the Children’s Institute of the University of Cape Town and published in the South African Child Gauge last year. The position in each province is shown for 2003 (brown) and 2010 (blue). The bars show changes in absolute level of income poverty defined as living on household income of less than 575 rand a month. 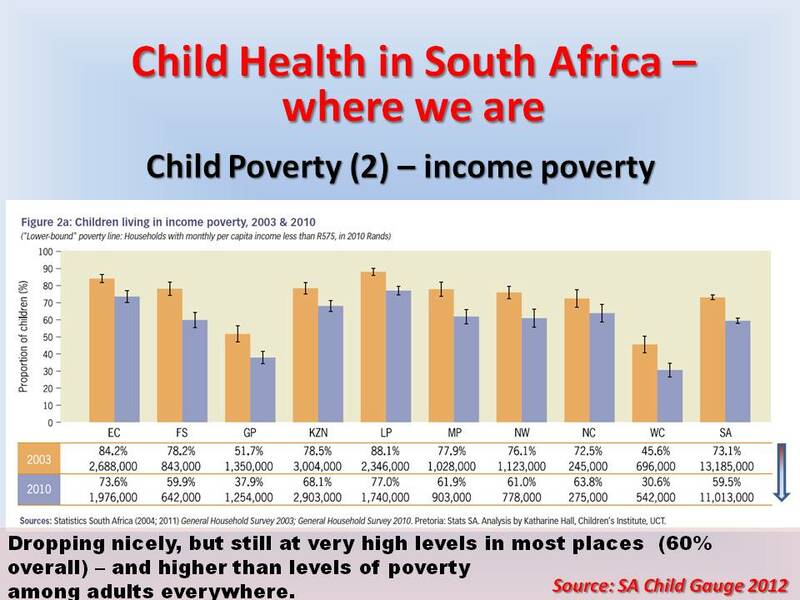 Hearteningly levels of child poverty are dropping; however in some provinces more than 70% of children are living in poverty and the level of poverty for children is higher than it is for adults all over the country. 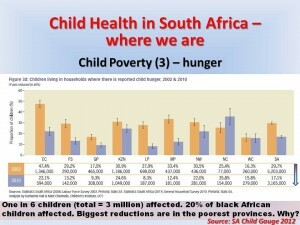 When looked at through the lens of food security, we see general improvements here as well, though an inexplicable change for the worse in the Northern Cape. 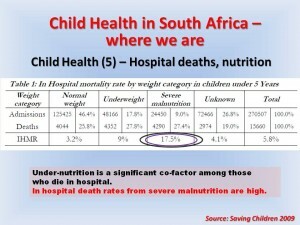 But significantly, any children in South Africa (about one in six) are still experiencing hunger regularly. I wonder if anybody can explain why these improvements might have taken place, given that circumstances such as unemployment are not shifting downwards to any significant degree? 3 letters C and S and G…. 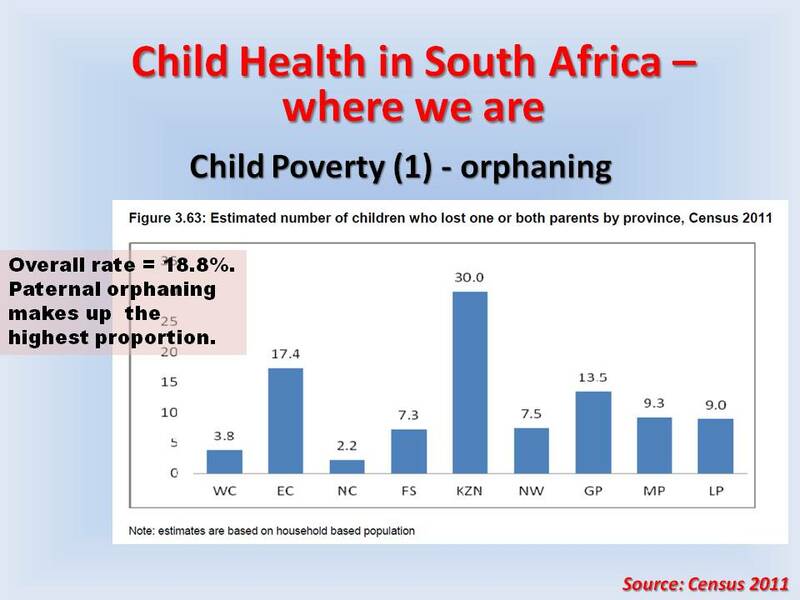 Looked at from another perspective, we find that children are not living in very good housing in many respects. 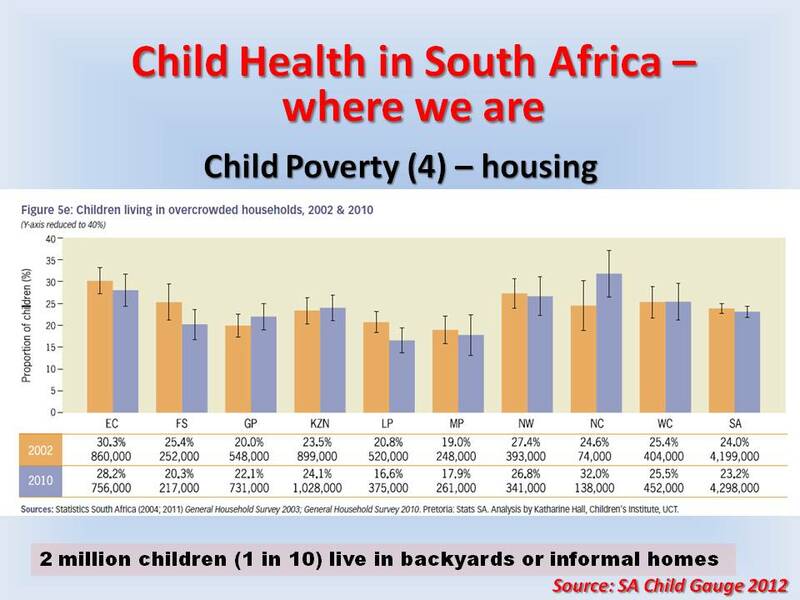 This is not shifted between 2002 and 2010, and about 2 million children are living in backyards or informal homes. Again, as a proportion, living in poor housing is higher than for adults. The two letters T and B ought to be firing of in our brains, – and letters A, R and I. 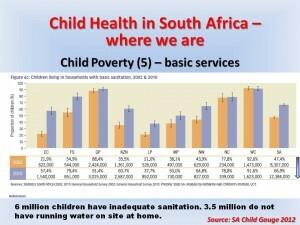 And what is it like in terms of access to basic services like water and sanitation? 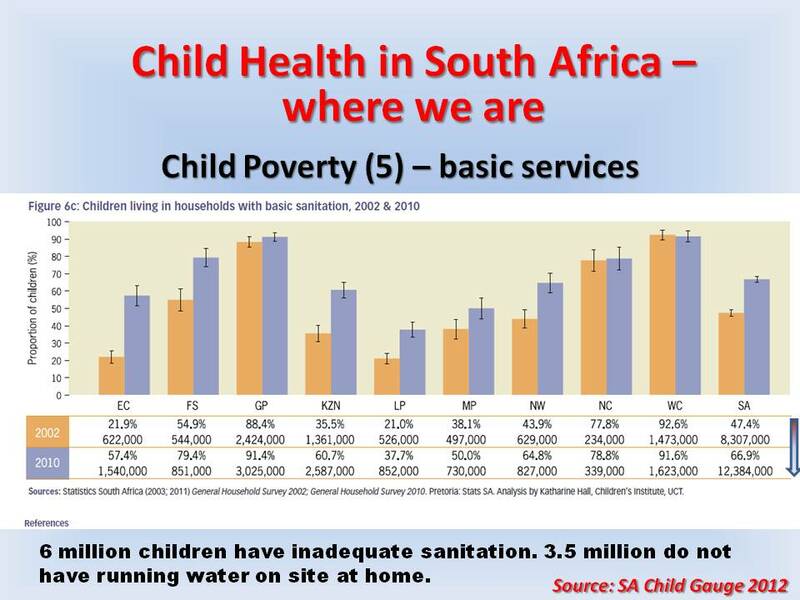 Well, it is very good if you live in an urban-predominant province and it is improving overall, but there are still large numbers of children in this country who do not have access to safe water and safe sanitation. You don’t need me to tell you that this has significant health implications for young children. The letters D and D come to mind. And looked at from the point of view of multiple deprivation (which I’m heartened to have discovered is being used by the Department of Health to decide where to focus their municipal Ward-based community teams which will be talking about later), you will see that the areas in dark blue of multiple deprivation coincide rather neatly and depressingly with a map that we may remember from the 1970s and 1980s. 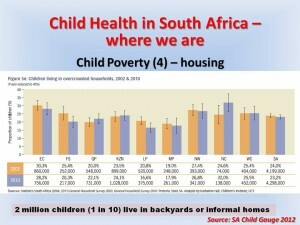 Yes, the former homelands are still the areas where children are living in dire circumstances with implications for the health indicators we will see in a moment. 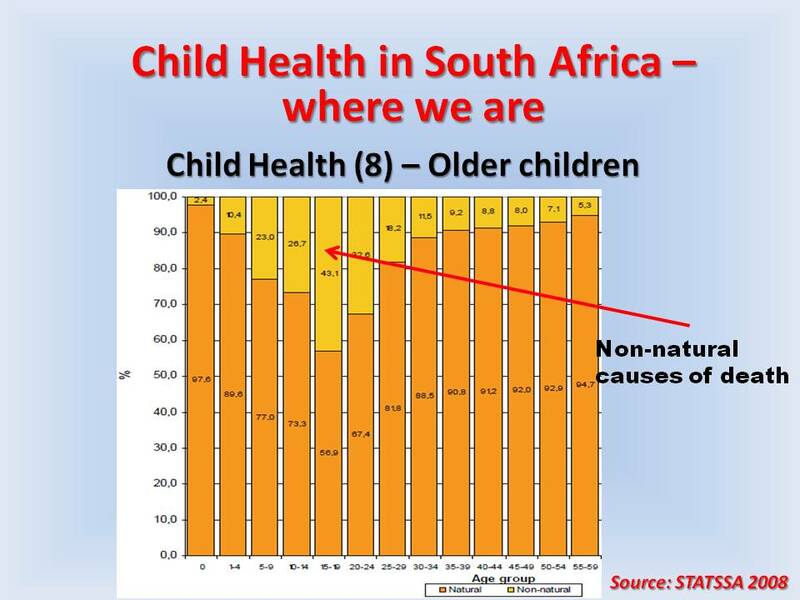 So if you are a child – especially very young child – there is a more than average chance that you will live in an environment that promotes your becoming sick, an environment that will also make you more sick if you do get sick. What is more this environment militates against optimal management of your chronic illness or disability if you have one – and you’re more likely to have one because of your environment. You will also live in an environment that makes it more difficult for you to access healthcare. Climate change, environmental pollution etc.